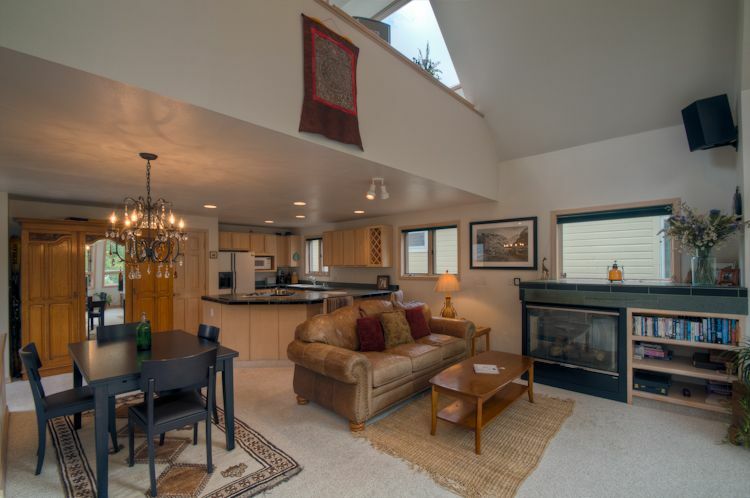 Madison Pacific Town Home-Massive One Bedroom with southern exposure and a fireplace! We thoroughly enjoyed our stay at the condo. The open floor plan was nice, and all four of us (2 kids on the pull out sofa) fit comfortably. My favorite thing was taking a shower with the amazing mountain views and heated floors. It was a short walk to the Coonskin lift and a little further but manageable to the gondola. Thank you for taking the time to share your experience at the Madison Pacific Town home. This is the cutest little spot. It is perfect for couples or small families. It is located right in the heart of Telluride, making it easy to get to the gondola or the shopping and dining on Main Street. A short walk to everywhere, lots of snow, and heated floors in the bathroom. Great Place! And a special thank you to Kelsy at Accommodations at Telluride who made sure our checkout, bags, and shuttle were no problem! Thank you for taking the time to pass along your thoughts on the Madison Pacific Town home. It is a great spot anytime. Thank you for mentioning the hard work of Kelsy. We are lucky to have her! Thank you for your wonderful review of the Madison Pacific Town home. We forwarded your couch comments to the owner. We hope to see you all again next winter. Or maybe this summer during festival season. Thank you a have a great 2019! Great location, had everything you needed! Could walk everywhere! Warm and Inviting. The Madison Pacific Condo is perfect for two! We can't wait to see you again soon. We were so comfortable in the Madison Pacific town home. The open concept was sunny and lovely. We loved the views from nearly every window. And after reading the guestbook we were able to actually see Bridal Veil Falls from the bedroom window. We spent 4 nights during the 3rd week in September and it was so beautiful with all the Aspens near peak colors. Everything is close by and this very charming town is very walkable. There is a free Gondola that takes you up to the Mountain Village. We went up several times for the views and awesome photo opps. Check out the library. We signed up for a library card and checked a couple of DVDs. We found a sports bar off Main Street to watch the Broncos game. They had 8 TVs with 8 different games. There is radiant heat (at least that's how the floor in the bathroom felt like). We hope to be lucky enough to come back to this little slice of paradise. Thank you so much for your AMAZING review of our Madison Pacific Town Home! You are absolutely right, it is close to everything and also away enough for nice quiet evenings. Brown Dog Pizza, I believe is where you enjoyed the Bronco's game. One our favorite spots. Be sure to try the Brooklyn Bridge pizza next time. Once again, thank you for this great review and we hope to see you again next summer, or perhaps this winter on the slopes! Summer Festivals of all flavors abound in the Spring, Summer, and Fall!